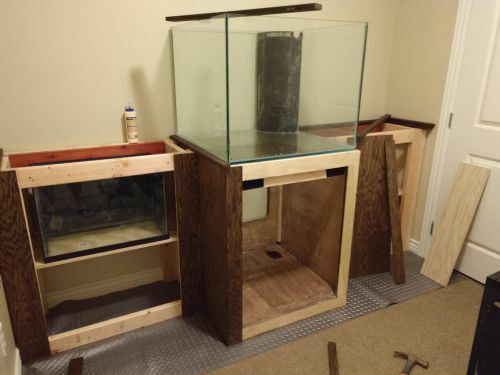 I thought it was finally time to start a tank build thread. 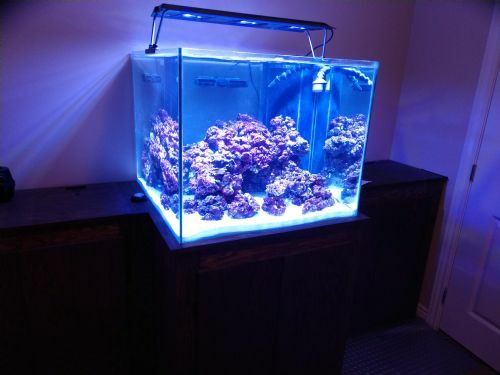 A little history about me: I first started reefkeeping when I was in college. I wanted a pet in my dorm room at the University of Nebraska Lincoln, and basically they didn't allow cats, dogs, etc, but DID allow up to 55g fish tanks. I bought a 29g eclipse system and kept a few fish and some mushroom corals. 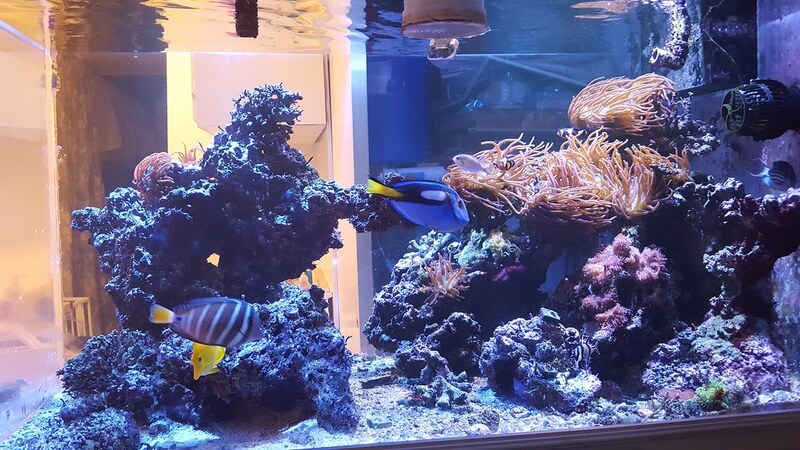 Later, after moving out of the dorms, I upgraded to 65g tank and then in medical school, I went big with a 225g reef tank. 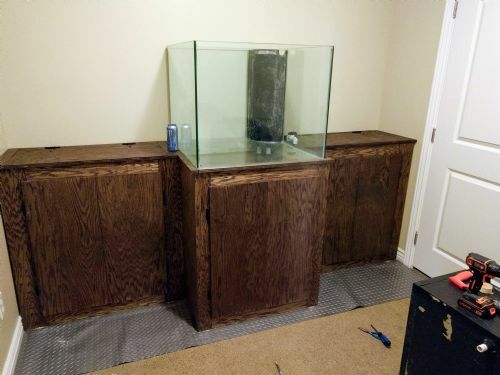 I matched here in SLC for residency at the U, which meant that I had to tear down my old tank, unfortunately. It didn't make the trip out here, and I sold off much of my gear. Obviously needed a good cleaning! 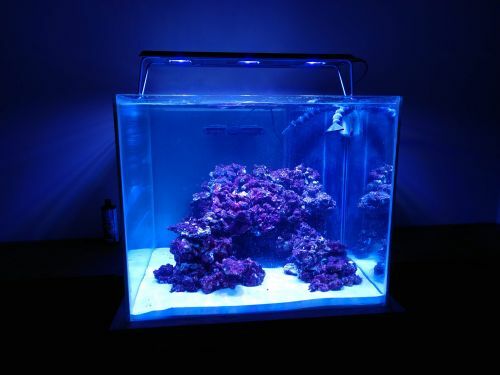 I inherited the tank, a stand, canopy, acrylic sump, reef octopus int/ext 3000 skimmer, a UV sterilizer, a magdrive 12 return pump, and some various other smaller pumps/powerheads. I cleaned everything using mostly vinegar and water, with some bicarb if needed. Obviously wanted to avoid any chemical cleaners! 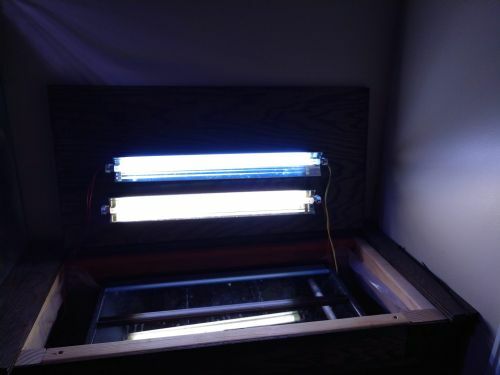 I picked out a nice room in the basement of my house that remains fairly stable in regards to temperature, and it's an inside room without a window so as to reduce unwanted algae growth. The room is also conveniently located adjacent to the furnace/utility room for getting fresh water/draining during water changes. 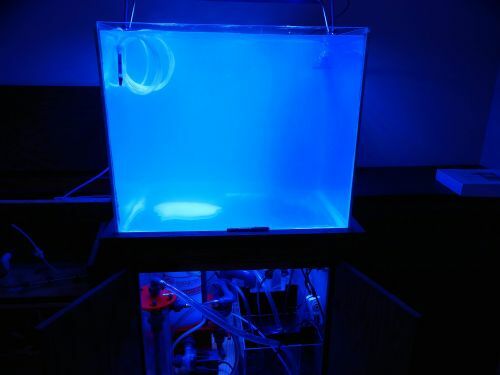 The next thing I wanted to figure out was my plan for a mixing system and refugium. 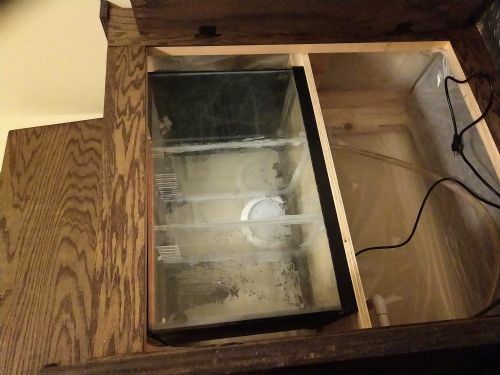 The sump I inherited was somewhat small, and I also wanted to increase total system water volume, so I wanted to have a separate tank for both a refugium and mixing tank. These would be located adjacent to the tank in some cabinets. 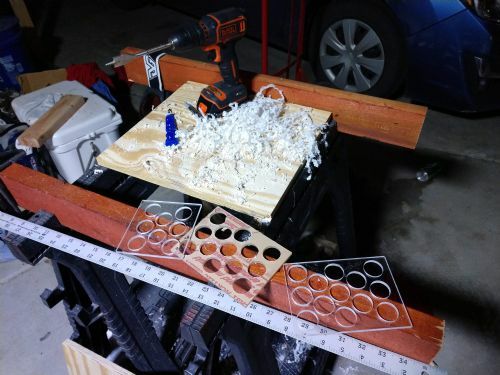 The next step was to build the stand and cabinetry for the system. 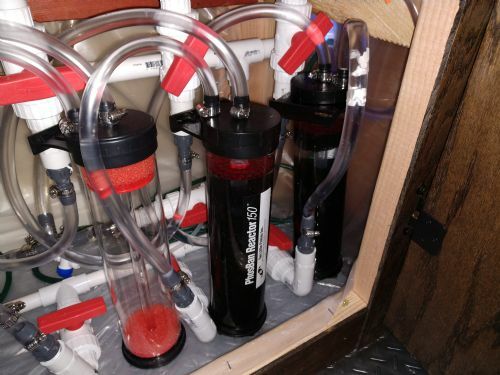 The left cabinet has a 20g high that serves as a mixing tank. 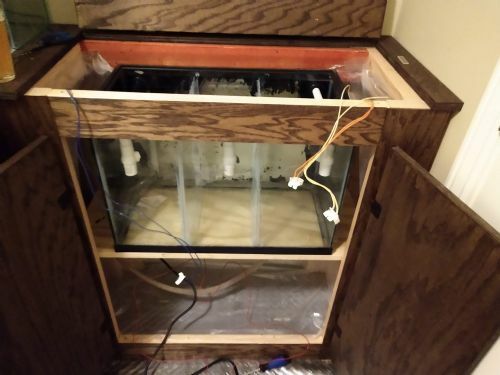 The right cabinet has a 20g high that will serve as a refugium. 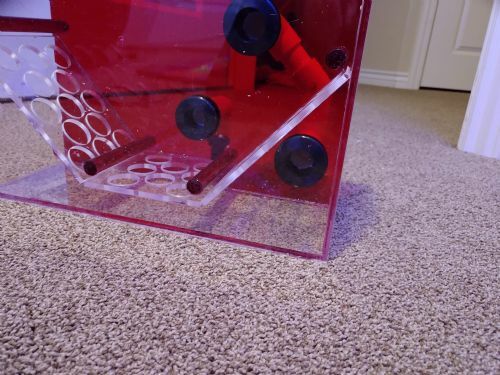 The wife required that we put down some waterproofing beneath the tank, so we got some cheap plastic flooring from Lowes and cut that to size before putting anything in. You can see that the fronts of the cabinets all open up with doors, and the tops of the side cabinets lift up to give access to the refugium and mixing tank. 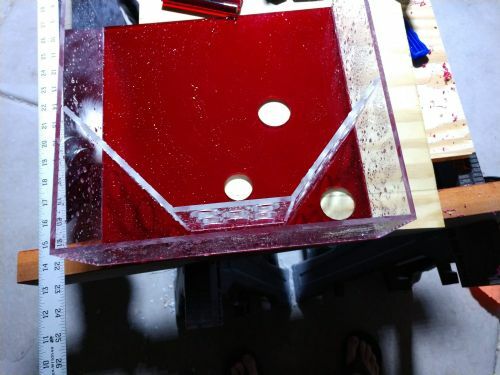 I drilled a piece of acrylic at the back of the sump to plump the returns from the mixing tank and refugium. Next was plumbing everything in. 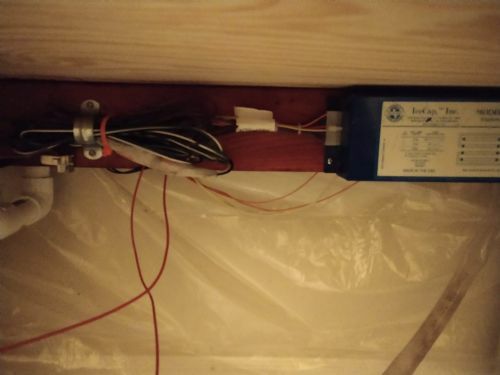 I drilled holes through the sides of the stand and also a hole through the wall into the utility room next door, where the RO/DI unit is located. I got a marine depot 100gpd 4 stage unit during black friday deals. 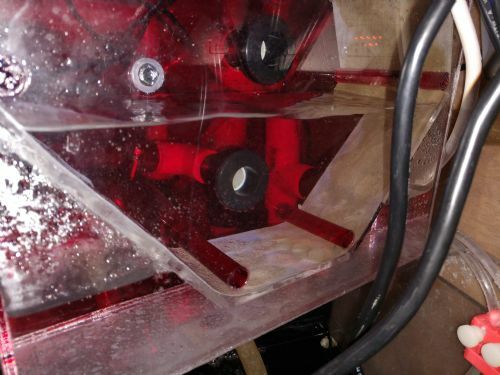 You can see that the skimmer has a biomedia reactor plumbed in before the skimmer. 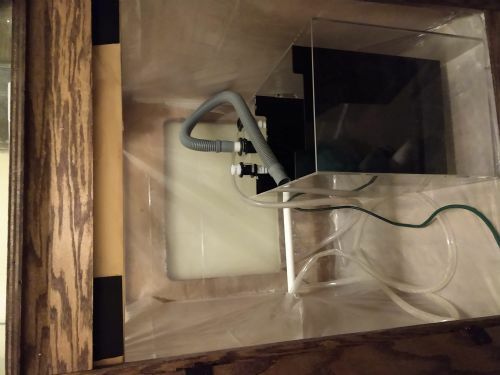 I installed a auto top off down in the final chamber of the sump and created a custom acrylic bracket so that I can adjust the height of the auto top off. The top off is hooked up to the RODI unit in the utility room. For lighting, I shopped around, but really liked the reviews of the maxspect systems. They have a really nice day/night cycle and the reviews were good. I haven't started growing anything, so hard to know how it'll work out in the end. I also put in a maxspect gyre for water movement. Next, came filling the tank, adding salt, and then sand. I added reef crystals to achieve a SG of 1.025 and will try to maintain that salinity. Should stay pretty consistent with the auto top off. 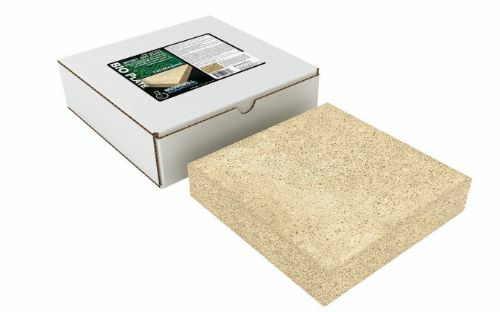 For sand, I used carib sea arag-alive bahamas oolite. This is a very fine substrate, and I was worried that it would blow around the tank, but it actually has been great and doesn't move much, but does give a nice wave pattern on the bottom of the tank. Moment of truth! 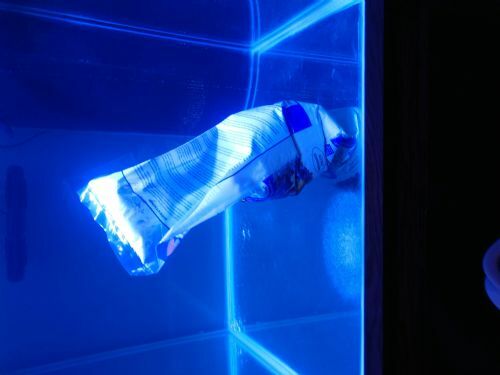 I put the bags down into the tank after cutting a small corner off the bag, turned off all powerheads/pumps, and tried to gently let the sand come out of the bag. Well, didn't prevent clouding! Took about 4 days to completely clear up, even with the biomagnet clarifier. On day 3 I turned the pumps back on, and on day 4 turned the gyre back on. 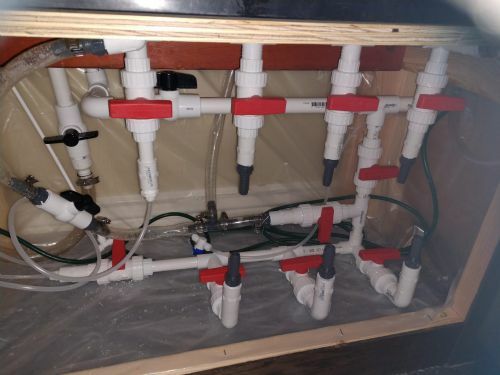 Unfortunately, I don't yet own a calcium reactor, but the plumbing is there and ready for it when I do eventually get one! I would have preferred more branching and arches. But you gotta work with what you've got. Now comes the long process of tank cycling. On one hand this is exciting, but on the other hand it is a painstakingly long wait! 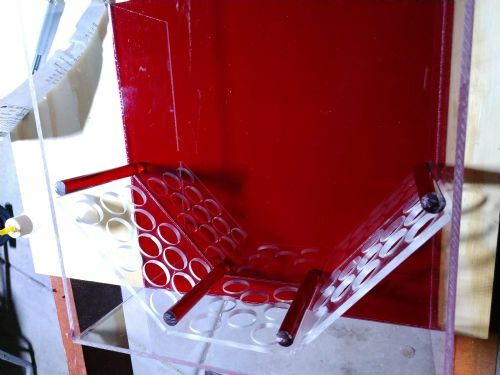 I used Dr. Tim's ammonium chloride to start the cycling process. I thought about putting a shrimp in there and letting it decay, but didn't want the smell. I also thought about a sacrificial fish, but my wife basically said no creatures should be harmed in the cycling of the tank, so that was also a no-go. 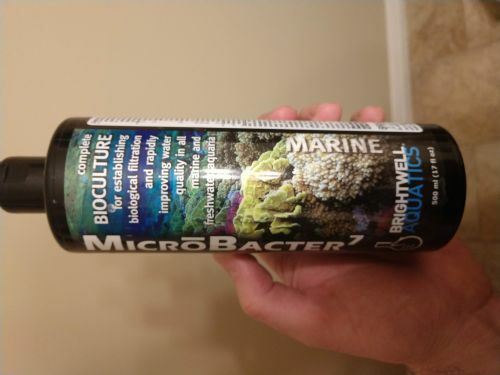 Plus, I listened to a convincing podcast that said that by adding pure ammonia as a source and using a bottle of denitrifying bacteria, you avoid buildup of opportunistic contaminant bacteria. pH has been fairly stable. It started at 8.0 and went up to 8.2, backed down to 8.0 as ammonia went down (no idea if those are linked somehow? ), but has gone back up to 8.2. Ammonia was added the first 3 days until it hit 4.0 ppm, then I stopped adding. It has slowly declined and has just hit 0 for the past 2 days. 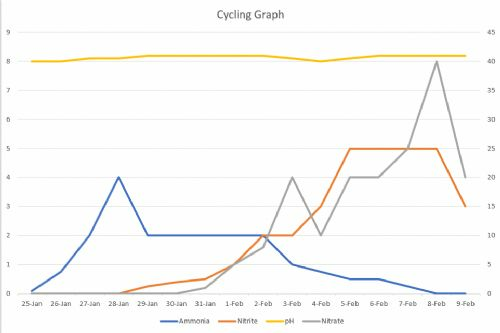 Nitrite went up slowly but steadily starting on day 5, and it appears to just now be declining. Nitrate followed just behind Nitrite, as expected. I actually already stocked the refugium with caulerpa and chaeto. I wasn't sure if it would survive the ammonia, but it appears to have done fine. It may be serving to keep nitrates from rising too high just yet. The intake is the solitary hose barb in the middle bottom. 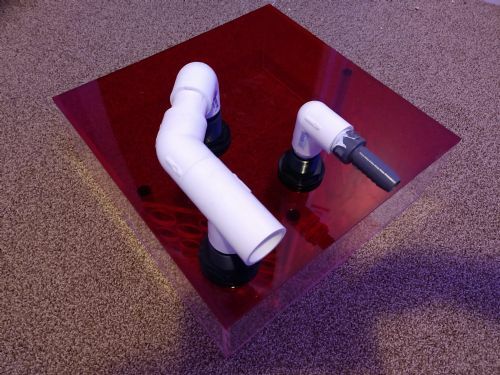 The water then goes through the filter fleece and through the holes in the acrylic plates and drains out the outlet in the bottom corner. Just in case the fleece is clogged and the water backs up, there is an overflow outlet higher up. I have the motor for the filter roll, but I'm still waiting on the filter fleece roll itself. I ordered a " 4" klir filter fleece roll " from bulkreefsupply. Unfortunately, when it came, I realized the fleece roll itself was only 3". It was just marketed to be for the 4" system. So I have reordered the clarisea 4" roll, and it says on the website the roll is ACTUALLY 4" wide. 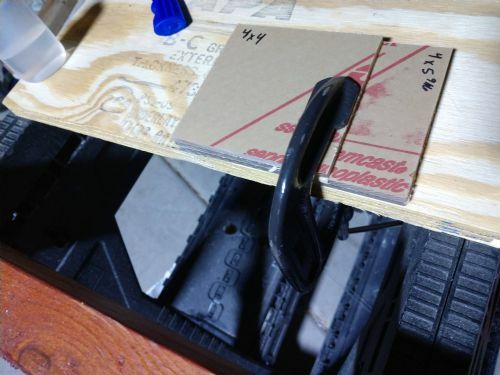 Hope it's correct, since I designed the plates 4" wide. I'll have to return the other one. I'll post more pictures as parts roll in. Well it took a while, but finally got the roller mat filter working! And it's awesome! 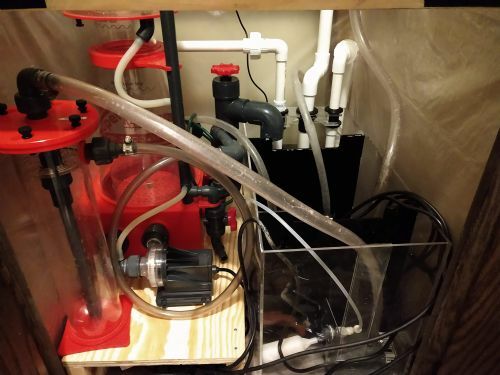 I have a small pump (with no filter guard) that pumps aquarium water from the sump into the unit, which sits on top of the sump. The water flows in the middle input bulkhead just above the filter roll. The water flows through the filter cloth and exits through a bulkhead in the lower right corner, which drains back into the sump. You can see that the pressure differential through the filter cloth causes a difference in water level on the two sides of the cloth. As debris clogs the filter roll, the water level rises in the middle. Eventually, it reaches the optical sensor, which tells the unit to turn on power to the motor that winds the filter roll paper. This pulls the dirty cloth out and winds it up, and also bring new fresh cloth into the water, which is more permeable to water due to no debris build up. 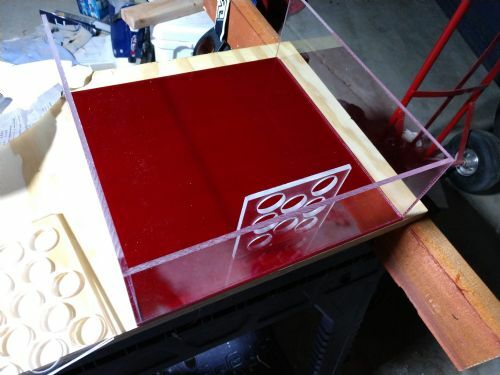 The water level will then quickly decrease with the new clean filter paper. If the sensor ever fails or the unit runs out of cloth, or can't roll in new fleece for some reason, there is a backup overflow just above the level that activates the motor. In the first video, it's just a trial run of the clean filter floss. 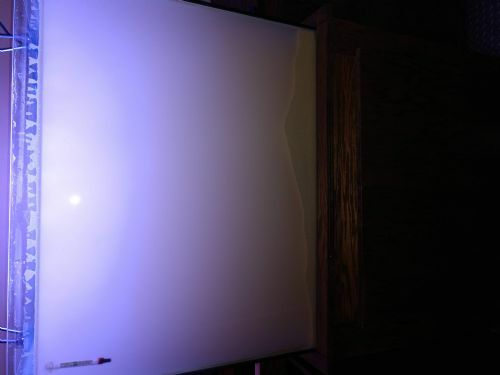 The second video shows the dirty floss leading to water level rising, triggering the sensor, which then rolls the paper and the water level goes down. Pretty dirty on the 'used' side of the roll! That's pretty cool. Great build! Following along. This is awesome! 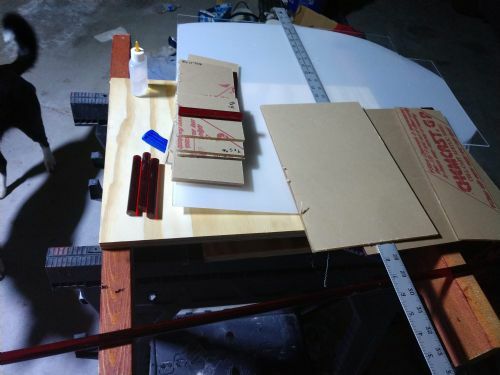 How much do you have into making this diy roller mat. It looks relatively inexpensive. Looks like you figured out the optical sensor issue you were having.